Yep, I think that pretty much covers it. There is nothing peaceful, graceful, and carefree about jogging. I despise it. Yeah, I know you’re remembering that I ran track in high school and that must have involved some sort of jogging. (Or maybe you didn’t know that tiny fact about me.) Let’s be real. Have you seen the length of my legs. They weren’t really made for track star status. However, track did get me out of taking PE everyday. Yes ma’am, I went to practice every day for an entire semester just so I didn’t have to dress out and learn to play tennis, or softball, or heaven forbid, soccer! (Soccer involves way too much running.) Besides, I did have an image to uphold, and getting sweaty did NOT promote cute girl status. Sounds a little vain, but be honest, how many of you did crazy things to get out of PE in high school? If your not impressed with my PE-avoidance prowess, maybe I can wow you with the fact that in 2 years of being on the track team, I only ran in one – you heard me right – ONE track meet. Amazing, isn’t it. I’m still not sure how I got out of all the other ones. Sorry for the background info. Let’s get back to the subject. Jogging. Currently, I have decided that it needs to make an entrance in my life again, so I started jogging about a month ago. Even worse, I’ve decided that I want to run a 5K race. Scratch that, I want to finish a 5K race, not so much concerned with running the whole thing. But Alicia, why would you want to run complete a 5K when you despise running so much? Great question. Answer: I’m not one to let something beat me. 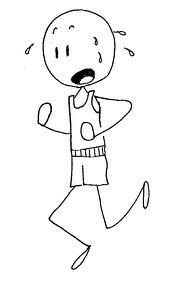 My complete loathing of jogging is paradoxical in that I must conquer it. I must not let jogging beat me. Thus, I will run a 5K before I leave for Ecuador. Jogging isn’t all negative. I have managed to discover a few positives. First of all, when I run, fat jiggles. I’m pretty sure if I run enough, the jiggling will pay off, and the fat will magically disappear. (If this isn’t true, don’t feel the need to inform me. Ignorance is bliss in this situation.) Secondly, it helps me develop my power of positive thinking skills. My mantra while jogging is, “I think I can. I think I can. Every part of my body is screaming, but I think I can!” Another pro is I’m learning to focus – all those negative, consuming daily thoughts must be pushed aside as I focus on reaching my goal: jogging to at least the next mailbox in the neighborhood. Finally, and most importantly, I find that God can speak to me during those huffing and puffing moments. So much of my life is noise, and jogging leaves me only with the sound of pounding feet, heavy breathing, and the quiet whisper of God. No matter the pains or positives, I will conquer my hatred of jogging. Currently, I am working on Week 2 of the Couch to 5K plan. I’m happy to report that I can now jog more than I walk, and I’m working on a 12 minute mile. Can’t say that I’ll completely love jogging one day, but I do enjoy the fact that it hasn’t conquered me yet. This entry was posted in Uncategorized on September 10, 2010 by aliciachall28.